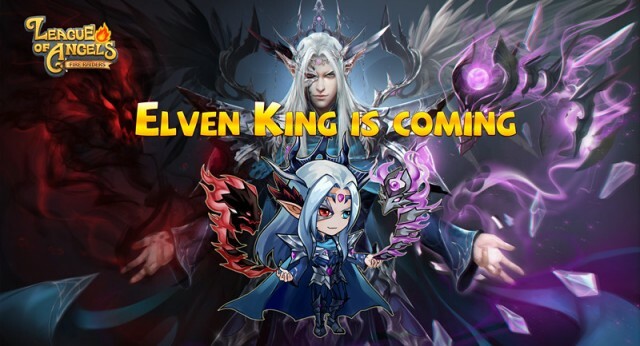 New hero -- Elven King is coming now ! There is not much to say about the Elven King, because the reclusive nature of the elves’ life permits very little information to leak to the outside world. Most only know they live deep in the forests somewhere southwest of the center of Elysium. It’s a prime location for young heores to test the strength of their swords, but few have returned home alive for the forest is bestrewn with unforeseeable dangers. But a recent event in the elves’ homeland has forced their king to seek help from League of Angels. After so many years we finally have a chance to meet this “King of the Elves”. Are you excited? Sunblade (Ultimate): Unleashes the ancient elven sword Sunblade to attack 2 enemies with the highest HP percentage, deals additional 30% damage against Warrior class heroes. Pyroblast: Launches a Pyroblast at the enemy with the highest ATK to deal great damage and inflict Burn, also reduces their ATK and DEF for 2 rounds. Firestorm: Elven King conjures a torrent of flames to damage all front row enemies, the affected targets also take 50% more damage for 3 rounds. King’s Fury(Passive): Elven King restores his Rage each round, additionally all attacks now ignore 20% of targets' Magic Defense. Flame Ward(Awakened): Elven King surrounds himself with Elven fire to increase his attributes. Elven King is a master of magic and his piercing spells can penetrate through the strongest shields and armors in Elysium. Elven King is especially threatening to warrior heroes, as his ultimate deals 30% more damage to them. His skill Firestorm targets front row enemies and increases their damage taken for the next 3 rounds to set up quick kills. His skill Pyroblast, which blunts enemies’ weapons and armor, largely reduces the threat from high ATK archers and mages. Elven King also possess incredible rage recovery speed and his attacks always ignores 20% of target’s magical defenses. Want to know where to meet him? It is said that the Elven King will attend our Revel from next Monday to Wednesday(2016/11/28-2016/11/30). Saddle up now!